The CTS Turbo FMIC450HP Intercooler. 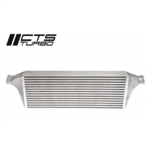 Used in the CTS Turbo 1.8T FMIC kit this intercooler uses cast aluminum end tanks and a high density pressure tested core. This intercooler is rated at 450 crank HP and measures 25.25"x8"x2.75". End tank to end tank is 35.5". 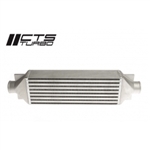 The CTS Turbo 600 Intercooler uses a high density core and utilizes cast aluminum end tanks. Each core is pressure tested to ensure you get only the best. This intercooler is rated for 600 crank HP. Core measurements are 20"x11.25"x3". End tank to end tank measures 28.5". 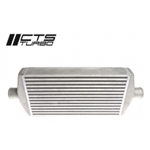 The CTS Turbo FMIC750HP Intercooler uses cast aluminum end tanks and a high density pressure tested core measuring 25.5x9.5x3.5". End tank to end tank measures 35". 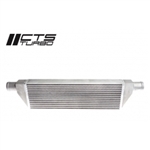 This same intercooler is used on the CTS Turbo 2.0T TFSI Race FMIC kit and is rated at 750 crank HP.